SCVHistory.com LW2290a | Film-Arts | William S. Hart Beats Paternity Swindle (Part II: 1938-39). August 20, 1939 — William S. Hart arrives at court in Los Angeles where a judge tosses out a 20-year-old paternity suit. Wire service photo by Wide World Photos Inc. from the archives of The Baltimore Sun, showing crop marks as the Sun ran it Aug. 31 (per the date stamp on the back). 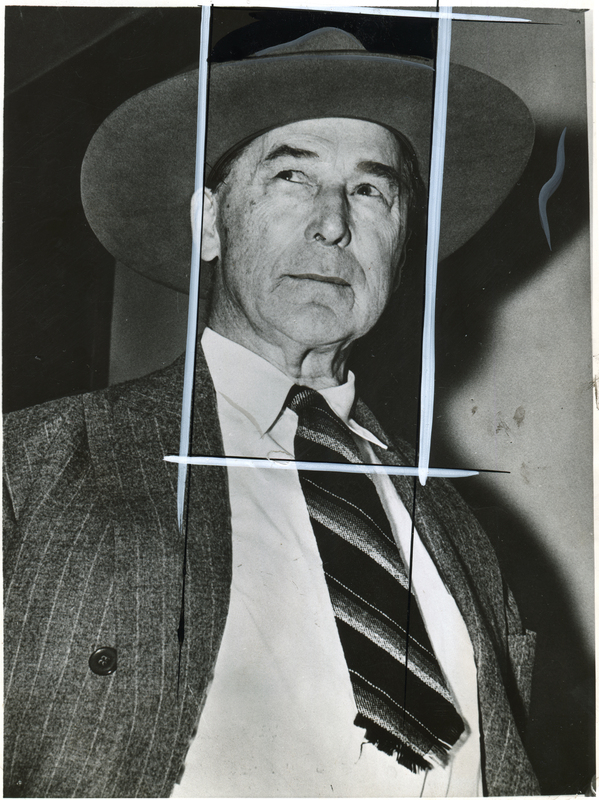 WILLIAM S. HART WINS HOAX SUIT. 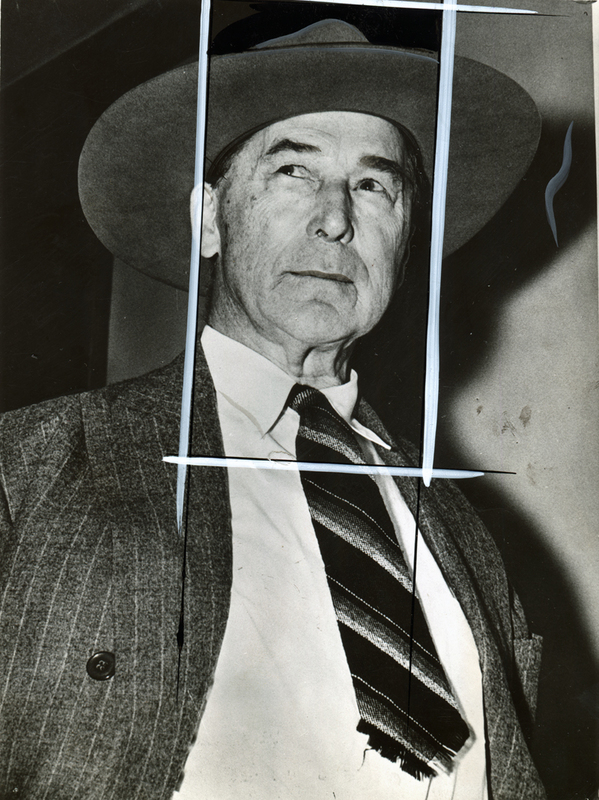 LOS ANGELES, Calif. — William S. Hart, who in the days of the silent film played the part of the western hero who triumphed in the end, is shown above as he arrived at court to win a battle of vindication in a charge brought 20 years ago by a woman who alleged that he was the father of her child. The court ordered the return of a trust fund he set up. The fund now totals $13,265.75. Notes: The Sun's photo editor used a grease pencil to highlight the brim and crown of Hart's hat. The barcode on the back is that of the 2012 photo seller. In 1919 a fanatical fan came to Los Angeles and convinced the district attorney, first, that she had a son, and second, that William S. Hart was the father. Neither was true, but the DA believed her. Rather than risk a scandal which, in those days, might have ruined his film career, Hart agreed to set up a trust fund. He deposited $7,000 and made monthly payments. The scandal erupted anyway in 1923 when Hart's young wife used the existence of the fund as ammunition in her suit for divorce. (Hart would make just three more movies, the last in 1925.) Hart stopped the monthly payments to the swindler, but his initial deposit sat in the bank until the trust agreement expired in 1938. At that time he successfully sued to get back the money, which had grown to more than $13,000. His good name was finally cleared and the scandal that dogged him for 20 years was over. Bill Hart Sues to Break Trust. Restoration Fund Set Up for Boy Who Never Existed, Asked. Los Angeles Times | December 17, 1938, pg. A10. The existence of a trust fund, veiled in mystery for the last 15 years, was brought to light yesterday when William S. Hart, erstwhile two-gun cowboy of the silent screen, sought to recover $12,000 from money he placed in trust for a boy who never existed. Hart filed the suit in Superior Court against the Security First National Bank of Los Angeles asking a declaratory release of the money. According to the suit, on March 13, 1919, Hart set up a trust fund of $6928.75 for the "son" of Elizabeth MacCaulley, a Boston schoolteacher, who accused him of being the father of her child, Rupert Leigh, supposedly born on Sept. 3, 1917. Hart declared that the bank was instructed to make payments to Miss MacCaulley of sums ranging from $150 to $750 yearly. On June 15, 1923, the petition declares, Hart discovered that he had been defrauded, as such a boy had never been born, and instructed the bank to stop payments, which it did. Since that time neither Hart nor Miss MacCaulley has received any money from the fund which, the actor says, now amounts to approximately $12,000. Hart asked the court to invoke a clause in the trust agreement which provided that if "Rupert Leigh" died, the unspent fund was to revert to him. News stories courtesy of Tricia Lemon Putnam. Screen Star Hart Has Back At Last Good Name, Money. Old Scandal Cleared Up; He Was Not Philanderer. The Helena (Mont.) Daily Independent Record | August 19, 1939. Los Angeles, Aug. 18. — (AP) — William S. Hart, silent pictures' leading two-gun man, today won title to the balance of a trust fund he established two decades ago for a "son" later proved to be not his son. The court told the 66-year-old former star at the end of the proceedings, "this certainly is a belated vindication." Hart set up the trust on representations that he was the father of a son born to Miss Elizabeth McCaulley. She later confessed, however, that she obtained the boy, then one year old, from his real mother, Mrs. Lucy Webb, now of South Lincoln, Mass. Hart testified he created the trust under threats of prosecution from the Los Angeles district attorney and in fear his screen popularity would be jeopardized. Hart's counsel said no action to recover the trust money was taken until recently because the trust agreement, hoax or no hoax, did not expire until July, 1938. After the expiration, filing of the suit was delayed in efforts to obtain depositions. Miss McCaulley, now residing in Winnetka, Ill., was reported finally served in the case of publication. Hart's former wife, Winifred Westover, divorced him after the scandal arising from Miss McCaulley's claims broke. "About December 1, 1918," Hart testified today, "Miss McCaulley came here from Boston with a child she claimed I was the father of. She went to the district attorney and he seemed to believe her story. "I could not convince him I was absolutely innocent." Hart said he knew Miss McCaulley only casually. Asked if he had ever been at all intimate with her, he declared: "Absolutely not!" William S. Hart Vindicated in 20-Year-Old Baby Hoax. Court Orders Assets of Trust Fund Created to Protect Career of Westerns' Star Returned. Los Angeles Times | August 19, 1939, pg. A1. Two decades late, but final, complete vindication came yesterday to William S. Hart, the hard-riding, two-gun-toting film idol of yesteryear. Two late, much too late, it was for Bill Hart, now 66, still erect, keen-eyed and alert to resume the career which was ruined by the monumental "baby hoax" perpetrated upon him back in 1919. But Hart, a bit hard of hearing, smiled as he walked out of Superior Judge Thomas C. Gould's court because he had not missed the judge's final comment in disposing of the litigation which resulted from the hoax. "A belated vindication," the judge had said. The case before Judge Gould was a lawsuit brought by Hart for dissolution of a trust fund he created 20 years ago to provide for the support of a child supposedly born to Miss Elizabeth MacCaulley. While he steadfastly denied that the child, named Rupert Leigh, was his, Hart said he agreed to the trust fund under pressure from authorities, who threatened him with a prosecution which he knew would end his days in pictures. It was dissolution of the trust and return of its assets which Hart obtained through his suit, but with him the issue of vindication was far bigger than the $13,265.75 he will recover. "Did you execute this trust?" inquired Hart's attorney, James G. Scarborough, as his tall, gray-haired client laid his wide-brimmed hat aside and ascended the witness stand. "Yes." Hart replied. "I wrote a check for $7[? Illegible]. "What was the occasion?" the lawyer continued. "I was forced to make the trust," Hart reminisced. "It was on Dec. 1, 1919 that Miss MacCaulley came here from Boston. She went to the District Attorney (the late Thomas Lee Woolwine) and accused me of being the father of her child. "The District Attorney believed her story and summoned me to his office. Night after night I called on him at his office but I could not convince him that I was absolutely innocent. I was pulled and hauled all over the country. "Finally he told me that he was going to prosecute me if I did not set up a trust fund for support of the child. I asked him what proof he had against me, but he declined to tell me. "At that time I was probably one of the most important stars in motion pictures and I knew my career would be ruined if the story came out, and I had no proof to refute it. It would discredit me in the eyes of millions of people who had learned to love me and to whom I owed a debt of gratitude." While he agreed to set up the trust fund, Hart continued, his attorneys did not cease their investigations and finally, in 1921, the whole truth came out. In this connection Hart's attorney offered Judge Gould a deposition taken a few months ago wherein Mrs. Lucy Webb of South Lincoln, Mass., told her part in the hoax. Mrs. Webb's role, as told in her deposition, consisted of "lending Miss MacCaulley her own son, Robert Webb, who was then represented to Hart as Rupert Leigh. "Years later Miss MacCaulley herself confessed her deception." Hart resumed. "But by that time I had resigned from pictures." "How well did you know Miss MacCaulley?" Attorney Scarborough inquired. "I had only met her twice and then only casually," Hart answered. Hart's suit was directed against the Security-First National Bank of Los Angeles, which holds the trust funds. The bank, however, offered no opposition to the suit, requiring only that Hart go through the legal phases. Miss MacCaulley, now reported living in Winnetka, Ill., likewise offered no objection and was not present in court. "I see no reason why the trust funds should not be returned to the plaintiff," said Judge Gould after hearing the strange story. "A belated vindication." LW2290a: 9600 dpi jpeg from original print purchased 2012 by Leon Worden.